Television make their long-awaited Australian debut this October performing headline shows in Perth, Sydney and Hobart alongside their Victorian exclusive at Melbourne’s ATP off-shoot, Release The Bats. Founded in New York City in 1973, Television played their second ever show in early 1974 at then fledgling country / bluegrass club CBGB’s inadvertently creating a hub for their own activity as well as the pre-alternative culture of the lower Eastside and like-minded individuals including The Patti Smith Group, Blondie, Talking Heads, Richard Hell, The Heartbreakers & Ramones. In 1975 Television followed up their reinvention of CB’s via the release of their debut 7″ Little Johnny Jewel, a two-sided 7 minute opus of street talk and taught no frills guitar work that featured the prodigious talent of singer / guitarist Tom Verlaine. Released on the independent record label Ork, it is one of proto-punks rarest and most valuable finds. In 1977, following increasing major label interest Television finally signed to Elektra (home to The Doors, The Stooges and Love) and released their debut album, the absolute classic, Marquee Moon to massive critical acclaim. It was an instant success cracking the top 30 in several European countries and going on to become of one rock’s most influential albums. In 1978 Television released their second album, Adventure. While less favourably received than Marquee Moon, Adventure is still a masterpiece of songwriting and musical interplay. However, by the end of 1978 Television had split up. The drudgery of touring, the individual band members’ own artistic beliefs, and internal tension cited as the reasons. In 1992 Television reappeared – albeit briefly – producing an eponymous album and playing select shows including a headline show at Glastonbury, to further acclaim before again disappearing from the limelight. A career band Television clearly are not. Then, in 2001, Television made a surprise return at the UK’s All Tomorrow’s Parties Festival. This time though, they decided to hang around continuing to play sporadic live shows and even threatening a new album. 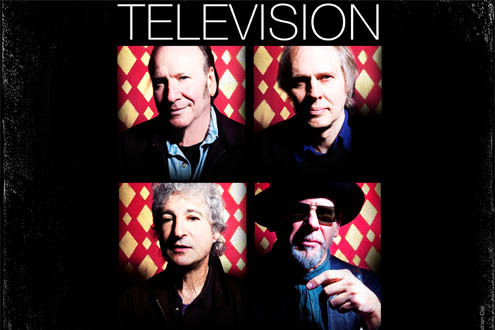 Finally, in 2013, Television are to make their Australian debut. Singer / guitarist Tom Verlaine, bassist Fred Smith, drummer Billy Ficca and guitarist Jimmy Rip will perform works from right across the Television cannon including the mighty Marquee Moon. Tickets for this unique experience go on-sale Friday 2nd August. Don’t you dare miss it!